It’s been a year of celebrations for the team behind Padstow Christmas Festival as it celebrates its tenth birthday. More than 200 people raised a glass to toast its unprecedented success at a special black tie ‘birthday ball’ in the grounds of Padstow’s historic Prideaux Place in September. 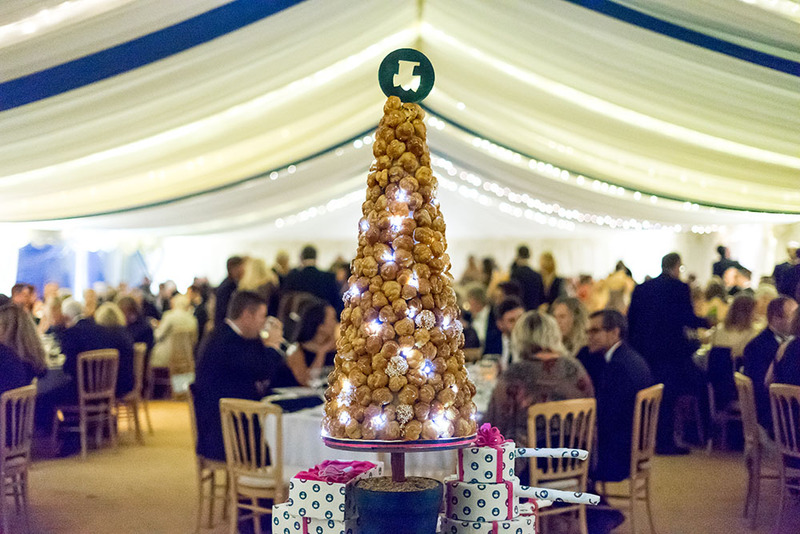 Partygoers enjoyed a delicious three-course meal and tucked into a fantastic four-foot croquembouche birthday cake made and decorated by award-winning Peboryon in Penzance. For the organisers, it was a chance to say an enormous thank you to longstanding supporters of the event, including Rick Stein, who’s championed it almost from the outset. The festival, which last year attracted more than 50,000 people to the harbourside town, enjoyed a modest birth, bearing little resemblance to the event it’s become today. It was conceived from a desire to make Padstow a year-round destination for visitors, to give a much-needed out-of-season boon to its shops, restaurants, and cafes. Rupert Wilson, then Steins’ general manager, said: “Many business people in Padstow had recognised the need for something to be done to attract people to the town in low season. “Initially, we devised the Passport to Padstow initiative where retailers, restaurateurs and accommodation providers worked together to provide incentives to attract visitors at traditionally quiet times of the year. “After two years, we decided to look at holding an event in the town to act as a draw, and the Christmas festival was born. The first one felt more like a fete than a festival, with only a handful of stalls in the Institute and a few cooking demonstrations in the Memorial Hall. Around 500 people visited the event that year. It’s grown exponentially since then, whilst maintaining the ‘local feel’ which makes it so special. And it has definitely helped put Padstow on the map. Organiser Tina Evans said: “The first year, it was really small, giving fruit to the idea of what we were hoping to do. We decided to give it another go the following year, and had a few more stalls and demonstrations. “Initially, we cajoled people to get involved; many of them still support the festival to this day, which is fantastic. “I remember having a meeting with Rick Stein and talked about what we were hoping to do, and he picked up his mobile ‘phone and started calling a load of his chef friends, including Mark Hix and Brian Turner, and they came. Artisan food, drink, and craft producers from across the West Country vie for stalls in the popular quayside Christmas market, and the organisers field requests for exhibition space from producers the length and breadth of the country. They resist any chance, however, of the festival becoming a corporate behemoth. Rather, they see it as a chance for the town to promote not only itself and all that it has to offer, but the creative talent for which the region has become so renowned.